Full Cast Revealed For ‘Twin Peaks’ Revival at Showtime!!! ‘Twin Peaks‘ fans have been waiting for the revival of the cult series that began it’s journey on ABC in 1990. ‘Showtime‘ and creators David Lynch and Mark Frost have come together to bring a new installment of the series to fans who have brought the short-lived series to cult status. Director Lynch has put together a cast of original and new cast members who have combined their creative talents to bring us another season of the intriguing series, which could be the first of more should the fans rally. The new series picks up right where the first one left off, but 25 years later. We began the series with a small northwestern town of Twin Peaks and the shocking murder of homecoming queen Laura Palmer, played by Sheryl Lee who is back along with the only other confirmed actor, Kyle MacLachlan as FBI Agent Dale Cooper. Until recently, MacLachlan has been the only confirmed actor to return, there has been a lot of speculation on who will be returning and who will be new to the town. One of the biggest disappointments for fans will be that Lara Flynn Boyle, one of the original co-stars, has decided not to return. 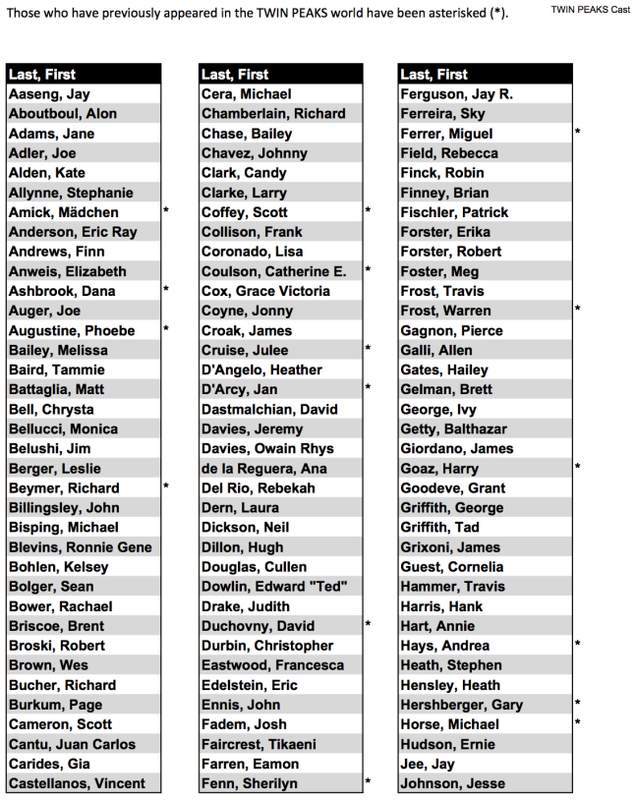 On the upside, we do have a full cast list which is spread out over the bottom two images. 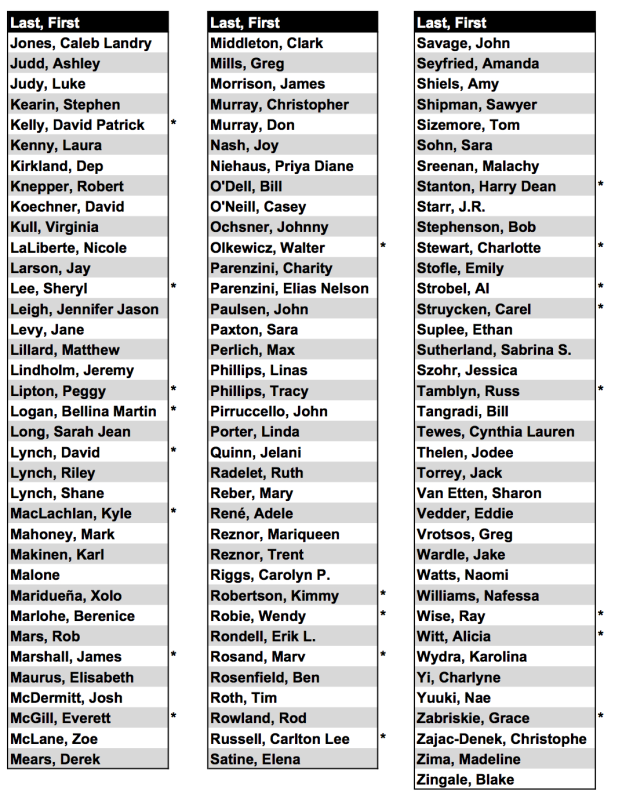 Lots of names, new to the series and those we’re already familiar with. The series is set to debut on Showtime in 2017. 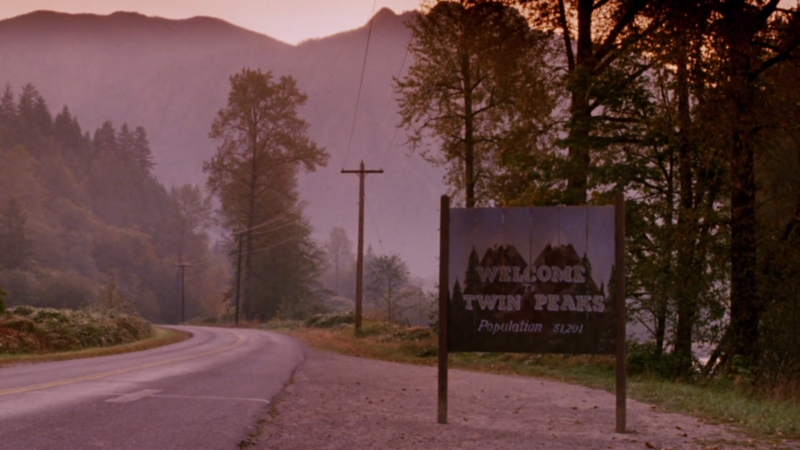 ‘Twin Peaks’ Trailer Urges Fans To Hang On For More!!! 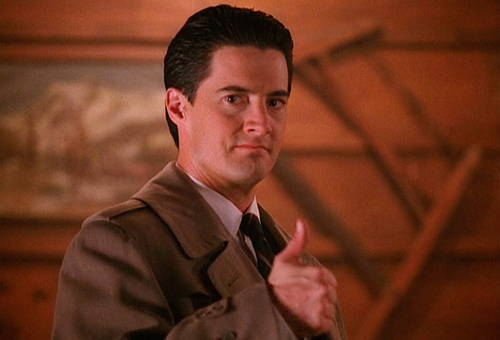 Kyle MacLachlan Returning to ‘Twin peaks’!!! The Weird Returns With ‘Twin Peaks’ On Showtime!!! Look Who’s Coming Back To ‘Twin Peaks’!!! This entry was posted on Tuesday, April 26th, 2016 at 2:32 pm	and is filed under News, Television. You can follow any responses to this entry through the RSS 2.0 feed. You can skip to the end and leave a response. Pinging is currently not allowed. « Disney’s Live-Action Calendar Looks Amazing!! !